Earlier this year, a sobering documentary called The Man Who Saved the World made the rounds of U.S. college campuses. That title sounds pretty dramatic, and it is. The film focuses on an event that occurred on September 26, 1983, during one of the most tense periods of the Cold War. Just three weeks earlier, the Russians had shot down a civilian South Korea airliner that crossed into Soviet airspace, killing all of its passengers. President Ronald Reagan, who had already denounced the Soviet Union as an "evil empire," called the attack "a crime against humanity [that] must never be forgotten." Lt. Col. Stanislav Petrov was in a bunker just outside of Moscow, monitoring the Soviet Union's early warning satellite system. It was Petrov's job to report a nuclear attack to his superiors, who would send the message up the chain of command until it reached Soviet leader Yuri Andropov, who would then decide whether to retaliate. They would have only an 8- to 10-minute window to respond. Just after midnight, alarms went off. One of the satellites had detected five U.S. intercontinental ballistic missiles (ICBMs) heading toward the Soviet Union. Repeated checks confirmed the satellite was working correctly. Petrov was skeptical that the attack was real. He figured that if the United States had actually launched a nuclear attack it would likely involve hundreds, if not thousands, of nuclear missiles attempting to wipe out Soviet forces, not five. He told his superiors it was a false alarm, but with no hard evidence to back up his assessment. Petrov's hunch proved correct -- and saved the world from nuclear disaster. Later it was discovered that the early warning system had mistaken the reflection of the sun on the tops of clouds for a missile launch. That's right. The sun's reflection almost started World War III. What's even more sobering is that this was not an isolated incident. 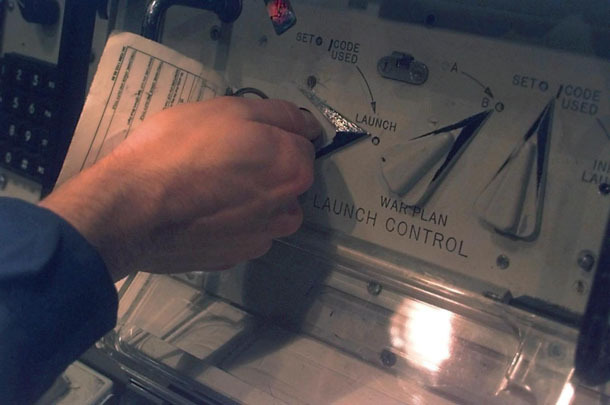 There have been a number of technical glitches and human errors in both Russia and the United States over the last few decades that could have triggered a nuclear launch. A civilian scientific rocket, a failed computer chip, and an improperly installed circuit card are just some of the culprits that could have led to an international catastrophe. To address this glaring problem, 166 countries voted in favor of a U.N. resolution last year that called on nuclear-weapons states to take their arsenals off "hair-trigger" alert status to dramatically reduce the chance of an accidental, erroneous or unauthorized launch. Unfortunately, France, Great Britain, Russia and the United States -- four of the five permanent members of the U.N. Security Council and all nuclear-weapons states -- opposed it. The issue, however, is expected to come up again during a month-long U.N. conference that began this week on the Nuclear Non-Proliferation Treaty (NPT), the international accord designed to halt the spread of nuclear weapons and eventually eliminate them. A coalition of a dozen countries, including Canada, Germany and Japan, will ask all nuclear states to take "concrete and meaningful steps, whether unilaterally, bilaterally or regionally, to further reduce the operational status of nuclear weapons." In other words, take their weapons off hair-trigger alert. What should the United States do? For David Wright, co-director of the Global Security Program at the Union of Concerned Scientists (UCS), the answer is straightforward. "The Obama administration should show some leadership and remove U.S. land-based missiles from hair-trigger alert status," says Wright, whose organization recently launched a campaign to raise public awareness of the issue. "President Obama can do that immediately and without congressional approval, and it would make the world a much safer place, regardless of what other nuclear states ultimately do. He doesn't have to wait, and he shouldn't. He needs to act." The policy of keeping U.S. land-based missiles on a hair trigger dates to the Cold War era. Back then, military strategists on both sides feared a surprise first-strike nuclear attack -- not only on cities and industrial sites but also on their land-based nuclear missiles and bombers. To ensure that they maintained the capability of responding, both countries kept their land-based nuclear weapons on hair-trigger alert so they could be launched within minutes to avoid being destroyed on the ground. Whether or not this use 'em or lose 'em policy made sense years ago, it doesn't anymore. Just ask Lt. Gen. James Kowalski, who became deputy commander of the U.S. Strategic Command in October 2013. Before taking that job, he oversaw U.S. ICBMs and nuclear bombers. He says the notion of a Russian first strike at this point is "hardly worth discussing." Other, much more likely things, worry him far more. "The greatest risk to my force is an accident," Kowalski said at a July 2013 forum in Washington, D.C. "The greatest risk to my force is doing something stupid. That puts my force at risk, more so than almost anything out there I can think of." Kowalski wasn't directly referring to hair-trigger alert, but a number of high-ranking military officers and government officials have singled out that policy as one that could most easily lead to a disastrous accident. For instance, Gen. James Cartwright, a retired four-star Marine Corps general who served as commander of the U.S. Strategic Command and vice chairman of the Joint Chiefs of Staff, recently co-authored a column in the International New York Times calling on both the United States and Russia to "scrap this obsolete protocol before a devastating error occurs." Now chairman of the Global Zero Commission on Nuclear Risk Reduction, Cartwright was the lead author of a 2012 study, co-written by former Defense Secretary Chuck Hagel, that advocated that the U.S. government end hair-trigger alert. Cartwright and Hagel's recommendation echoed one made by former Secretaries of State Henry Kissinger and George Shultz, former Defense Secretary William Perry and former Sen. Sam Nunn, who proposed a series of steps to establish a foundation for a nuclear-free world in a January 2007 Wall Street Journal column. Their very first suggestion was to modify "the Cold War posture of deployed nuclear weapons to increase warning time and thereby reduce the danger of an accidental or unauthorized use of a nuclear weapon." Recent U.S. presidents also have acknowledged the threat. George W. Bush referenced the issue during his first presidential run. "The United States should remove as many weapons as possible from high-alert, hair-trigger status -- another vestige of Cold War confrontation," he said in a May 2000 speech. "Preparation for quick launch, within minutes after warning of an attack, was the rule during the era of superpower rivalry. But today, for two nations at peace, keeping so many weapons on high alert may create unacceptable risks of accidental or unauthorized launch." Barack Obama, too, touched upon the subject during his first presidential campaign. "Keeping nuclear weapons ready to launch on a moment's notice is a dangerous relic of the Cold War," Obama said in an interview published by Arms Control Today two months before he was elected. "Such policies increase the risk of catastrophic accidents or miscalculation. I believe that we must address this dangerous situation." We're now into the third year of President Obama's second term. So why are U.S. ballistic missiles still on high alert? The short answer is that no one in the administration has made this a high enough priority. To those who worry that taking U.S. missiles off hair-trigger alert could compromise national security, UCS Senior Analyst Stephen Young points out that the majority of U.S. nuclear forces are on submarines, which are constantly moving and difficult to detect, making them virtually invulnerable. "Our subs represent a supremely capable response to nuclear attack, more than what would be required for any purpose," Young says. "They make the readiness level of our ICBMs irrelevant, even in a crisis." Adm. Stansfield Turner, Central Intelligence Agency director during the Carter administration, said as much in a 1999 interview with PBS' documentary series Frontline. "I think that one of the first things we should do is take every U.S. [nuclear] weapon off high alert," he said. "We have an absolutely insane policy in this country. ...Our missiles that count are in submarines out here at sea, and [the Russians] can't see those. So we can always counter-attack, no matter what they do in that attack." Of course, the world would be even safer if Russia also took its missiles off hair-trigger alert. A U.S. decision to do so, however, would likely encourage Russia to reciprocate. Either way, with widespread agreement that removing U.S. land-based nuclear missiles from hair-trigger alert would significantly reduce the risk of an accidental or unauthorized launch, the time is now for the United States to lead by example, especially when the advantages are obvious and the disadvantages are negligible. Accidents happen. Let's make sure they aren't nuclear.